'Desert Jubilee' OGB- (Lin Flanagan, R. 1994). Seedling 90055-1. AB, 24" (61 cm). Midseason bloom. 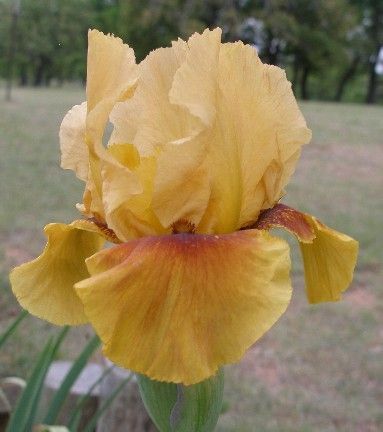 Standards and style arms deep golden yellow; Falls rich golden yellow, smooth red brown wash over upper third;brown beard;slightly ruffled;falls semi-recurved.83040: (('Esther's Son' x ('Esther, The Queen' x (('Nomohr' x Sundt 5656D) x 'Dove Song'))) x 'Warrior's Mantle') X 'Dazzling Gold'. Aril Society, 1996. Honorable Mention 1999; Mohr Medal 2005.